Firstly, very briefly, we are now just over a week away from the joint all-day conference on ‘Names: Kent Places and People’ that will take place in Powell Lecture theatre on Saturday 12 November. There are still tickets available at: http://www.canterbury.ac.uk/arts-and-culture/calendar.aspx or email artsandculture@canterbury.ac.uk or phone 01227 782994. Another date for those from Canterbury is Tuesday 6 December at 6pm in Old Sessions House when Paul Bennett, the Director of Canterbury Archaeological Trust, will give his audience the story of his life as an archaeologist that will include his work in Libya, Iraq and Canterbury – not to be missed! Being in Petts Wood on Wednesday, I met Janet Clayton who is working on her doctorate under the supervision of Dr David Grummitt at Canterbury Christ Church. She is researching the history of Scadbury manor through its relations with London. As a leading member of Orpington and District Archaeological Society, she has for several decades been involved in numerous archaeological excavations in and around this moated manor complex. It is a gem of a place and this was my first opportunity to see it. The de Scadbury family as holders of the manor may predate the 1260s but, as Janet said, this is the first reference to them and is an interesting period because it coincides with the baronial wars between Henry III and Simon de Montmort, and the de Montforts had land in the area. 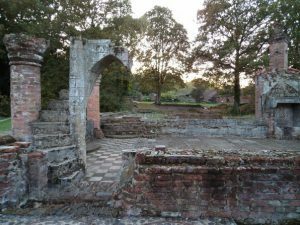 Nevertheless, Scadbury is usually associated with the Walsingham family who may have come originally from Little Walsingham in Norfolk. Yet the connection is closer because Thomas Walsingham was an extremely wealthy London vintner and like many of his social group he purchased land, or in this case a manor, in the early fifteenth century. He may have resided in Kent at times, but his London house probably remained his main residence, and he and his wife sought burial in their home parish of St Katherine’s by the Tower. Such London merchants, and in Thomas’s case his son, grandson and great-grandson continued to foster the relationship between town and country; court, London and the provinces, and it such connections and inter-connections that Janet is exploring. Of course, she is not the only history/archaeology postgraduate at Canterbury Christ Church working on a Kent topic, and among the others are Joseph O’Riordan and Jacie-Ann Ryan whom I have mentioned before. Joseph is working on the impact of the Reformation on the people of Canterbury and Jacie-Ann is exploring food history in Kent during the Second World War. However there are others and they include Cheryl Periton who is studying the development of numeracy in early modern society for a doctorate. She is using Faversham as her main case study, not least because the town and church court records are especially rich for this area of Kent. Lily Hawker-Yates will draw on archaeology and history as she examines how people explain the archaeology around them, both in the past and in the present. Using documents within Canterbury Cathedral Archives, such as parish records, she will seek changes in names of local places, which in some cases may reflect growing folk tradition. Another potentially valuable source for such a study are the Kent Hundred Rolls that date from 1274-5 and give information about who held land and what they were doing with it (digging ditches, buildings that may now exist solely as earthworks). Like Joseph, Hannah More has just started working on a Masters and her chosen topic is the suffragette movement in Kent, looking particularly at the differences in the experiences and attitudes of women in two regions of the county, firstly the Medway area, and, as a comparison, the apparently more militant women of east Kent. Furthermore, several staff members within the School of Humanities are at various stages of putting together project proposals to funding bodies from the Heritage Lottery Fund to the AHRC. Among the former who are looking to develop a more community-based project are Dr Lesley Hardy from History and Dr Mike Bintley from English Literature. I have mentioned their joint proposal before, but I thought I would mention that Mike told me recently that Lesley had been working very hard on the bid with Dr Andrew Richardson of Canterbury Archaeological Trust and that they had or were just about to submit an application to the Heritage Lottery Fund regarding the ‘Finding Easnwithe’ project. This will also involve a particularly active local history and archaeology group from Folkestone and hopefully it will follow in the successful footsteps of ‘A Town Unearthed’, also funded by the Heritage Lottery a few years ago. At a much earlier stage is a project on early modern Canterbury, which will employ the research skills of those at Canterbury Christ Church and elsewhere. This project is likely to involve Professors Jackie Eales from CCCU and Catherine Richardson from the University of Kent. I’m sure Jackie Eales is well known from her 1641 project on Canterbury, and Catherine has written extensively on material culture in the early modern period. Among her many publications are Everyday Objects and The Routledge Handbook of Material Culture in Early Modern Europe, and, as she and Tara Hamling have noted, ‘Knowing about people’s possessions is crucial to understanding their experience of daily life, the way they saw themselves in relation to their peers and their responses to and interactions with the social, cultural and economic structure and processes which made up the societies in which they lives’. Consequently, it will be interesting to see how all of these projects move forward and I will keep readers of the blog posted on developments.